Here a some Seward graves stones. I do not know how these people fit into the Seward line. Sarah Goss a sister of Nathaniel's married Enos Seward (Seaward) in 1765 and had 10 children. I am sure there were many more family lines for Seward/Seaward in the area. Enos moved to the area about 1792 from Granville, Massachusetts. Robert 1922 - ??? and Margaret 1919 to ???? Find A Grave has this cemetery listed along with a map on how to get to it in Fairmont Twp., which is above Huntington Twp. in Luzerne Co., Pennsylvania. There are 288 names listed which is 60% photographed. Nathaniel Goss, brother to my Solomon Goss (Solomon Goss of Fearing Twp., in Ohio blog) stayed in Luzerne County and died there. I featured his tombstone in the last post dated April 30, 2013. His son Nathaniel Goss and Thankful Forbes' tombstone was featured on the post dated April 16, 2013. Today we visit the grandson Nathaniel Goss and his wife Lucy H. Fuller. They are buried in Pine Grove Cemetery which is along a ridge in Huntington Twp. There are actually two Pine Grove's the other is in Nanticoke in Luzerne County. We are interested in the one near Harveyville. I did consult the cemetery books for Luzerne County but they only list: James W., Lucy H, Mary E. Nathaniel, Paul, and Pearl N.
When I visited in 2008 I only concentrated on Nathaniel, Lucy and Mary. I also wanted to see Harveyville which was more like a 4 corner intersection than anything. It doesn't seem to be listed on maps today. How do you get to this cemetery. It is southeast of Harveyville. We are targeting #5 on the map. Number #4 is the Old Goss Cemetery which I will share my experience of it in the a future post. 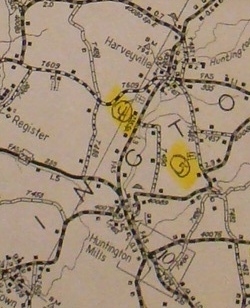 If you are going north on the Harveyville-Hunlock Road, turn onto the Harveyville Rd and then onto Wolfe Rd Tr483 and you will be on Cemetery Hill Rd. You should be there pretty quick and see the cemetery on your right. If you pass Browns Hill Rd (Tr516) keep going but don't go past Marsh Creek Rd. or you have gone too far. It is very visible on Google Maps in satellite mode. Nathaniel and Lucy Goss' stone. I get very sad when I see stones that are broken up against other stones. Next is the Mossville Cemetery in Huntington Twp., Luzerne County, Pennsylvania.